Sometimes at the end of a long week it’s easy to forget the moments that touched our hearts in the midst of all the hustle and bustle, taking the time to sit down and think about them has left me with a grateful heart. Stopping to read what others have taken the time to share has also been a lovely reminder of the things in my life I’m thankful for. Often it’s the big stuff I think about – family and love and all the good and wonderful things I’ve been blessed with, and sometimes it’s the smaller things, like the gentleman that held the door for me at the gas station or the blue jays that sometimes stop to visit me in the yard. This week my list is filled with the big things as well as a bunch of the little things. I posted this sometime last year, originally written for Ten Thankful Things. but I managed to jot down a few to share with you . . .
1. Faith – God is the cornerstone of my life. He is the floor beneath me, the roof above me, and the walls that surround me. He is my shelter from the storm. Faith keeps me going when I am sure I can go no further. It is the promise and the hope I cling to when I feel I am falling. It is my light in the dark places, it is my anchor when I am adrift, and the wind in my sails when I haven’t strength enough to row. Faith is the hand that steadies me when I falter, it is my compass when I am lost. It is the voice that tells me I can when I think I cannot. Faith is the foundation on which I stand when my solid ground turns to quickly shifting sands beneath me. 2. Family – The ones who’ve surrounded me with love since the day I was born. 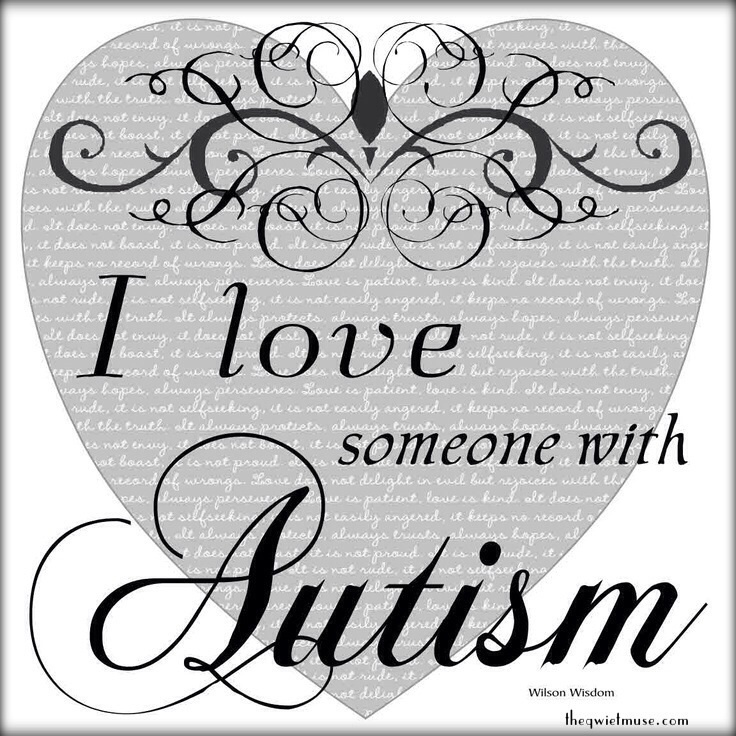 The ones that have cradled me in love and acceptance and unconditional love throughout my life. The ones who still do and the ones who continue to fill a place in my heart even though they’ve parted from this life. I see their smiles when I close my eyes, I hear their voices in silent moments, and I feel the love they’ve given me, always. My Grandparents, sisters, aunts, uncles, cousins, nieces, and nephews will always be a part of me. 3. My Mother – My teacher, my protector, my inspiration, my mentor, my friend. She carried me within her and then held me in her arms, she took me by the hand and by the heart and led me into life. Sometimes I followed her, sometimes she let me lead. She sacrificed and she gave, she sheltered and she pushed. She gave me wings and she taught me to fly. She has been my hero, my guardian, and my guide. She’s picked me up when I’ve fallen and she’s found me when I’ve been lost. She is everything I could ever hope to be. 4. My Father, My dad – My father planted the seed of life, my life. The twists and turns life’s journey sometimes takes placed us on different roads and he loved me enough to travel another until the day came when our paths would meet again and we would walk together as he’d one day dreamed we would. Now we know the way to where the other resides. My dad was not the man who planted the seed, but he lovingly tended to the garden in which I grew. He tilled and toiled in the soil as he watched me bloom and blossom. He nourished the ground beneath me, he made certain my roots were planted firmly. Those twists and turns led him away one day, but the care he took when he had it to give left me strong enough to continue to grow in his absence. 5. My Husband – My first love, my forever love. I wasn’t going to fall in love. Ever. I decided it when I was just a little girl, and then, when I was still a little girl in many ways – I fell in love with him. They said at 16 love is something you don’t fall into, but I did. He changed me and he changes me still. Something in his eyes told me love doesn’t always hurt, it doesn’t always end in pain and it wasn’t something I should deny myself. Even when I thought ours wasn’t going to be a story with a happy ending, I was still glad to have been a part of it, and as the pages continued to turn, the story kept unfolding and it has yet to end. 6. My Children – They are the reason every breath I take has meaning. They are my sun and my moon and every beat of my heart. They each came into my life, little pieces of love and completed something in me, they filled voids I didn’t know were hollow. I thought I knew the true meaning of love and then they looked into my eyes and I realized love was so much more than I’d ever known it to be. My life began the day theirs did, a new beginning with each tiny heart that began to beat. Never has there been a more beautiful sound. I used to hold their little hands in mine, and now they hold my hand in theirs and each of them carry a piece of my heart wherever they go. 7. Friends – I’ve been blessed by friendship. Somehow, through some miracle of love, I’ve chose and been chosen back by the best of the best and I’ve not words enough to describe the joys they have given me. I don’t surround myself with them, yet they surround me always. I’ve known some for nearly a lifetime, some for what seems like the blink of an eye, and yet, in my heart – they all reside. I’m so very different from most of them and they are each different from the others, but we have a connection that bridges those differences and leads us to a beautiful place. I don’t know if I am a good friend, I hope I am. I sometimes go for long spells without reaching out, I don’t chat on the phone for hours or hang out, but I’m there if they need me and I know they are there when I need them. Some of us have held hands, we’ve shared hugs and tears and laughter. Some of us appear to each other as letter after letter beneath the blinking cursor on a screen or visit each other through inboxes and emails, but I can feel the hugs we sometimes share just the same. 8. Words – I reside in a world of words, the characters that come together to form them, creating sentences and paragraphs; chapters and verses. 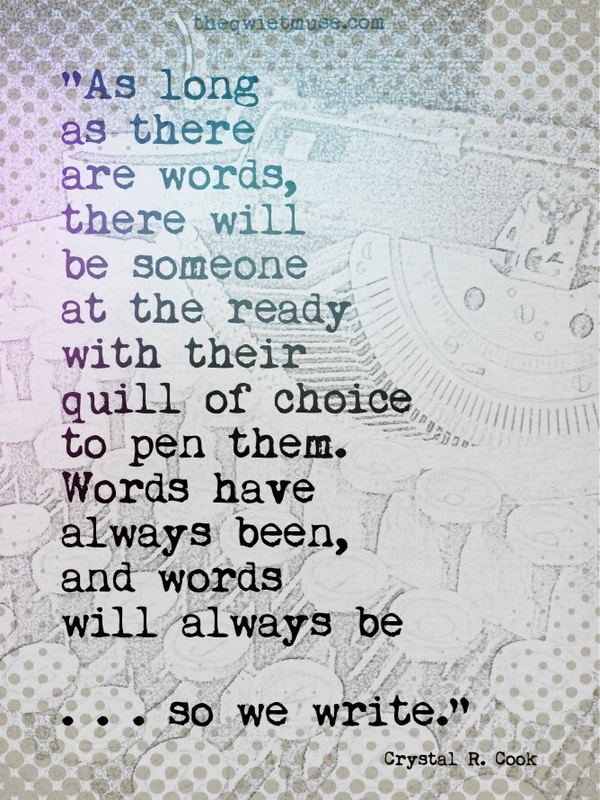 Words are my safe place, my way of reaching out to the world beyond me and the one within me. Words come into my soul, they release or they capture what resides there. Words written on a page transform me, they become a part of me, they bring me solace and comfort and healing. When I read them I’m transported to the magical place where they were born and when I write them, they become my own magical place. Without words I would wither on the proverbial vine, without voice, without escape. I find sanctuary within them, they offer me respite when I am weary and they provide company when I am alone. Words have been my constant and faithful companions in life, words have never failed me. 9. Books – My first friends in life. Stories real and imagined. Histories, heroines, and heroes. Underdogs, villains, and victors. I’ve been to far off places, made up lands, and real life destinations though I’ve never travelled far. I’ve had adventures, I’ve been on quests and crusades, I’ve loved and I’ve lost and I’ve taken fantastical journeys and come home again. I’ve battled monsters and I’ve been where angels have tread. I have read my way into the future and traveled into the past. I’ve soared above the clouds and I’ve explored the depths of the earth. I’ve seen more than I ever knew there was to see. I became a part of every story I’ve ever read and there are still worlds and words out there, waiting for me. 10. Technology – It seems an odd way to end my list of thankful things, but without it, I wouldn’t have some of the friends I have today. I wouldn’t know some of the things I know. I couldn’t have done some of the things I have done, so it is certainly among the things I am so very thankful for. The world I grew up in was quite different from the one we now live in. In some ways I miss the days before computers connected us, and in other ways, I cannot imagine life without them. Vast amounts of knowledge are just a few keystrokes from me at any time, friends and family can be reached with the touch of a button. Books and music are just a mouse-click away. But still, the excitement of receiving a letter in the mail or the anticipation of who’s on the other end of the line when the phone rings are things I sometimes miss. I often tell myself I’ll take the time to sit and write to someone the old-fashioned way, but I don’t do it often enough. 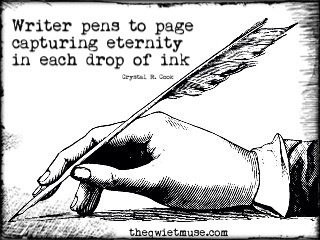 I love the sound of a pen gliding across a piece of paper and the smell of ink before it dries. I still prefer the feeling of paper pages and revel in the sound they make when I turn from one to the next as I read. I do love this little world I have found behind the computer screen though . . .
Miss Lizzi was nominated to share ’10-in-a-box’ – ten things in her house which make her happy or hold some significance for her, and in turn, I was one of her nominees. Before I get to my own, I just want to say I loved the items Lizzi chose ~ I am a little in love with a certain bejeweled froggy she posted, I kind of love froggies, I have one in my 10-in-a-box as well. As I looked around my house it was difficult to choose, there are so many things, so many memories. I found myself smiling like a goofball while getting all misty-eyed nostalgic over all the little chotchkies and favorite things I’ve collected over the years. These photos of my husband and I when were we each around 2 years old. Don’t they just look like they were meant to be side by side? I have a little red ball, he has a little red race car – both of us in the unofficially required early seventies striped shirts. It makes my heart smile every time I get a glimpse of them. Another photo – This is my favorite picture of us – My little sister and her impish smile, my beautiful mother, and of course, me. A lovely little Underwood I found in an antique mall in Oklahoma. Some of its pieces are missing, but I fell instantly, and madly in love with it. If it was in working order I would use it every day. This pink elephant. It’s one half of a little ceramic salt & pepper set – My mom gave it to me. When I was little, I had a pink elephant. Her name was Tina and she went everywhere with me. She was my best friend. I don’t know when she stopped being my imaginary friend, she’s still with me though, in my memories. Books. They are everywhere in my home. On shelves, in cabinets, in piles . . . I have a large collection of antique books that live among the newer ones. I treasure every single one. I found him at a thrift store, I love piggy banks and this one simply had to come home with me. He looks old, I can’t be certain how old, but hopefully he will live to a ripe old age in my home – as long as I don’t drop anything on his head. When it comes to gift giving, I’m not an easy person to buy for, but, sometimes my family finds the perfect thing. These are examples of perfect things for me. I’m a little kooky, I love owls and when my son saw this bust, he knew it was just right for me. He compliments the wonderful ampersand my husband found for me, don’t you think? This is a beautiful gift from my mother, it’s one of my favorite things. The top comes off and I can keep treasures inside, of course, the treasure is the piece itself and the memories attached to it. This last item isn’t really an item, if we ever move I’m taking it with me though. Sheet rock is easy to cut. This precious memory is in my laundry room, right behind my washer and dryer and I see it every day. There are a couple of these little notes around my house. My mom is always with me in some way. I’m supposed to nominate people now, but I’ve used up all my time for today – a few other things I am EXCEEDINGLY thankful for need tending to – My beautiful daughter is on her way to us right now! She is flying in for my son’s graduation ceremony tonight! I am so happy I can barely contain it! For four days I’ll have all my babies with me . . . I have so much to be thankful for. TToT – Ten Things of Thankful #4! Survived ANOTHER week! And another week has passed us by, I’m tempted to say it would probably be easier to come of with a list of ten things I am not thankful for, but that would sort of defeat the purpose of this fabulous link-up. I’m quite certain by the time I’ve finished writing about the good stuff though, the not-so-good-stuff will be shoved into some dark little corner of my mind where it will hopefully stay until it simply fades away. The power of positive thinking and all that. Alright then, onto my happy place . . .
Xanax. I am exceedingly thankful for Xanax. Candles in jars – My candle ban has been lifted, providing I only use the ones that come in jars. Here’s why —> It was an accident! Coffee. Because it will always be on my list of things I am thankful for. My daughter will be here at the end of the month for her little brother’s high school graduation. I miss that precious stinker. Anger management. I am thankful I am capable of it – especially when driving, going to the grocery store, the mall, Walmart, the post office, or my kid’s bathroom. Hair clips. It’s hot and I’m lazy. My kids are old enough to fend for themselves in the kitchen. Anything that is at least 50% off when I need it. I am thankful I awoke this morning with less pain than the day before, thankful for the amazing clouds that drifted above me today, thankful for time – time to write, time to read, time to spend with those I cherish most. I am thankful for the random act of kindness I witnessed today and I am thankful God has blessed me with so much to be thankful for . . .
TToT is in celebration mode! 100 link-ups and going strong! I’ve been reading the Thankful Things posts longer than I’ve been participating, this is only my third time joining in and since we’re celebrating, I added 100 random things I’m thankful for to my ten things. Lizzi’s lists have always made me smile, they’ve reminded me to be thankful for things I may have forgotten to be thankful for. Thank you for that my friend, it’s done my heart good. Thank you all for reminding me to be thankful. 9. Books – My first friends in life. Stories real and imagined. Histories, heroines, and heroes. Underdogs, villains, and victors. I’ve been to far off places, made up lands, and real life destinations though I’ve never travelled far. I’ve had adventures, I’ve been on quests and crusades, I’ve loved and I’ve lost and I’ve taken fantastical journeys and come home again. I’ve battled monsters and I’ve been where angels have tread. I have read my way into the future and travelled into the past. I’ve soared above the clouds and I’ve explored the depths of the earth. I’ve seen more than I ever knew there was to see. I became a part of every story I’ve ever read and there are still worlds and words out there, waiting for me.